Interact with the MarineMAP at marinemap.org/marinemap. 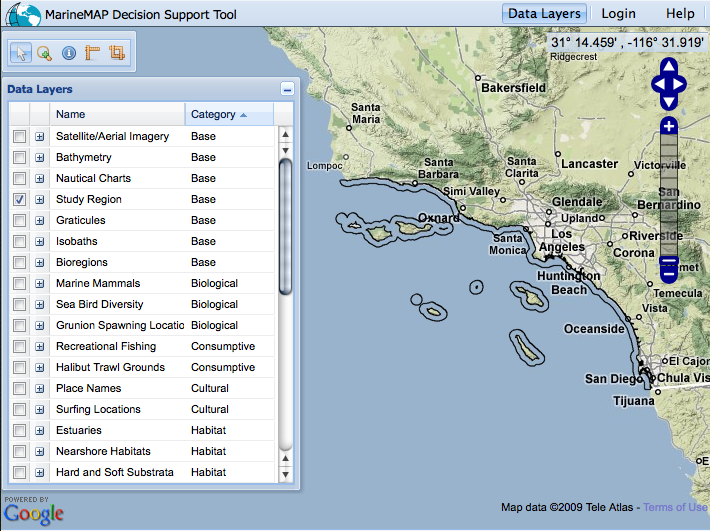 Interactive Map Tool Objective: MarineMap is an internet-based decision support tool that provides the capacity for the SCRSG (South Coast Regional Stakeholder Group) to view data layers, create individual MPA concepts, assemble collections of individual MPA concepts into MPA arrays, receive basic feedback on how well MPA concepts and arrays meet guidelines for MPA design, and submit MPA arrays to staff as MPA proposals. This tool will be the primary way in which MLPA Initiative staff and SCRSG members capture and store information regarding MPA proposals. 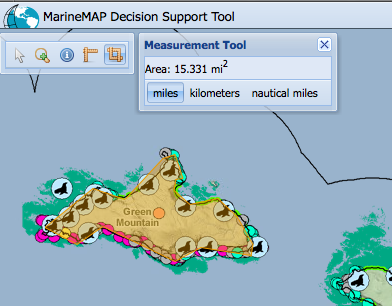 (Above) Screenshot above showing Marine mammal and Nearshore habitat layers on base map with area Measurement Tool enabled. (Question) Kelso’s Corner: What technologies are leveraged in MarineMAP? (Anwer) MarineMAP: We’re not using ArcGIS at all, save for cutting map tiles (using ArcGIS Desktop and Arc2Earth) and, as a non-critical component of the system, ArcSDE / SQL Server. We’re mainly using PostGIS, GeoDjango, Ajax, Flash, OpenLayers, GeoServer and MapServer and will soon switch to the Google Earth API. (Q) Kelso’s Corner: How many programmers do you have on staff to deal with all the software components? (A) MarineMAP: Currently, two of our developers work full-time on MarineMap, while our other two developers work half time. We also have several GIS analysts and a cartographer to deal with the data end of things. We are now looking for a full-time, in-house Assistant Web Developer to continue working on MarineMap. As we extend MarineMap to different geographies and planning processes, we anticipate that we’ll be looking for one or two more programmers as well. (Q) Kelso’s Corner: What was the rational for doing this substantial map development in house? Did you evalutate other routes, consultants, off the shelf software before going this route, why was this option preferable? Did you have a good cheat sheet for how to develop / implement this technology? Did you have to hire new staff to do the programming or did you have existing expertise to draw on? (Anwer) MarineMAP: We did not have a cheat sheet for how to develop / implement this technology. This was a brand new application using some new technologies, and some that we were familiar with. Of course, we had experience developing other applications and some of these technologies overlapped. But, there was a significant amount of learning happening for all of our developers. The MLPAI is an on-going process that will terminate sometime around 2011. Until then, we need to have a highly functional and stable application that can be adapted to the changing needs of the process. It turned out to be much more cost-effective and time efficient to hire in-house developers to work on the application year-round. Before we built our team, we spent a significant amount of time considering a host of alternatives, including trying to maintain and tweak Doris, contracting out all of the work, etc. Initially, we felt we did not have enough in-house expertise. Although we already had Chad Burt (UCSB), Jared Kibele (UCSB), Tim Welch (Ecotrust) and, now, Ken Vollmer (Ecotrust) as our in-house crew, we eventually contracted two developers from Farallon Geographics (Dennis Wuthrich and Alexei Peters) for a limited period to help with developing the database schema. This was particularly nice given that we had only 6 months to get the first version of MarineMap out the door. Dennis and Alexei are no longer working on the project but I am very grateful that we had access to their time and expertise during the initial phases. (Q) Kelso’s Corner: What was Doris? (Q) Kelso’s Corner: It seems there are many more RubyOnRails developers than Django. Have you found this a hindrance for hiring staff or when looking for trouble shooting advice? (Anwer) MarineMAP: It does seem to be a bit of a challenge finding Django developers, particularly those that can / will work locally. I have not tried to hire a RubyOnRails expert so I have no direct means comparison. (Q) Kelso’s Corner: Why will you be switching to the Google Earth API? Is this only for the front end? Have you been happy with GeoDjango? (Anwer) MarineMAP: GeoDjango has been fantastic. Using the Google Earth API does not mean ditching GeoDjango. Rather, using the Google Earth API represents a shift away from the OpenLayers API. We’ll still be using GeoDjango extensively. [Our lead developer] was a big proponent of RubyOnRails for quite some time, but Django has taken many of its best ideas to Python. While Ruby is aesthetically a beautiful language, Python is usually much faster and has a more mature set of modules to build on. The only thing I miss after switching over to Django is the database migrations Rails offers. Most open source GIS packages also have bindings for Python, where as there a few similar tools for Ruby. (Q) Kelso’s Corner: Besides the change to Google Earth API, what other changes, updates do you plan for this online map? (Anwer) MarineMAP: Besides switching to the Google Earth API, there is one major upcoming update to MarineMap. Specifically, we will be implementing a map-based (i.e., location based) discussion forum. Users will be able to zoom into a location on a map and tag objects (MPAs, data, places) with a comment. Other users will see these comments (if they have comments “turned on”) as they zoom in to a location or if they load an MPA. Users can then participate in a dialog via a traditional discussion forum that is linked to the map. Furthermore, users will be able to define a geographic region and subscribe to RSS feeds (using GeoRSS) for any activity within that region. One might choose to do this, for example, if they want to be notified by email any time somebody draws a new MPA in, or makes a comment about a data layer in a specific region that he / she cares most about. I believe the map-based discussion forum will go a long way in facilitating discussion about MPAs, particularly outside the in-person monthly stakeholder meetings. Conclusion: Thanks so much for the informative Q&A session. Please check out the MarineMap project at MarineMap.org/marinemap.